Molly Burch must be exhausted. We popped along to Leaf as she rolled into town with the end of her mammoth 43 date tour in her sights, a tour that has taken her from Budapest to Birmingham via Boston. While the Kazimier Christmas lights just outside the window made it look like there was a fire engine outside for most of the evening, inside, we were treated to a night of two halves. We decided early on that there was something of the Nebraska era Springsteen, or perhaps a little something Bob Dylan Esq about support act Andy Jenkins. We weren’t sure, we were even half tempted to critique his mid-Atlantic accent before he announced that he was actually from Richmond, Virginia. That did two things in fairly quick succession, explained the accent and vibe of his tunes, and taught us not to make quick-fire assumptions about support acts. We should know better, we blame it on the lack of coherent chat. One would imagine that coming from Richmond, Virginia and finding yourself on Bold Street on a decidedly drizzly December night might throw you off your game. Travelling is tiring, touring takes its toll, getting yourself and your gear across an unusual country is trying, Jenkins seemed a little bit nervous. His on-stage banter seemed forced, but that was forgivable given the tales and stories he sang about. There was a lot about love, relationships, travel, and laziness. A highlight for us was a track called Sweet Bunch, from which his album is named, a song about love and the world that exists around that. An interesting meander through perpetual motion, not entirely to our taste, perhaps cluttered by the sound not being entirely right. He played a short set and seemed happy to have done his bit. His recorded work is great, much more earthy, deeper, more soulful, but that seemed impossible to deliver live. Still, an intriguing prospect and one to watch If that’s your thing. 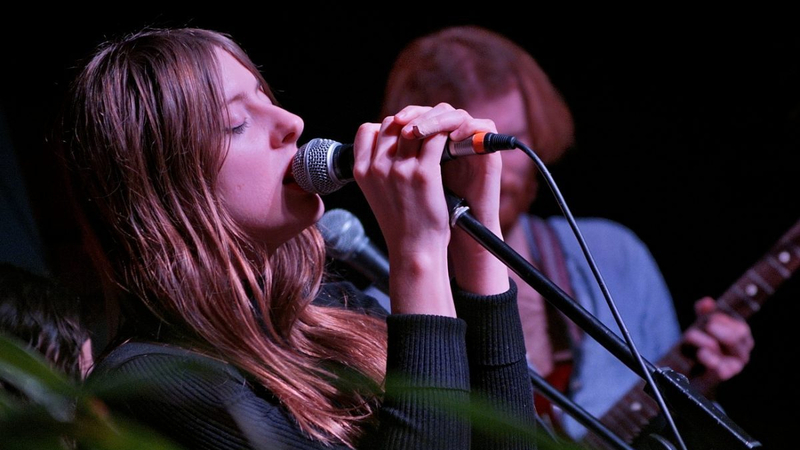 If we tried to find one word to describe Molly Burch that word would be sultry. While we’re on the letter S, our review could be summed fairly simply; ‘Sultry songstress swoons in smoky sixties saloon surreptitiously shifting sophomore selection…’ See? Hailing from L.A., Burchs’ mother is a movie producer and her father a writer, it would be easy to suggest that her musical influences were pretty close to home. She now resides in Austin, Texas after a brief stint in North Carolina, giving a further nod to her inspiration. Not unlike a certain Mr. Morrison, she recorded her album live over just two days at Moon Phase Ranch. Her recordings and performance are raw with emotion, and her live show reflects the recordings perfectly. Burch was signed to Captured Tracks just days after sending in a demo, a thing almost unheard of, this tour is a result of that relationship, a healthy one too by all accounts. And let’s face it, most unsolicited demos end up as coasters, door stops, table balancers or worse. She is joined on stage by four accomplished musicians, three guitarists, one of whom could happily stand in as a Bee Gee or Beach Boy, drums and Burch looks after the keys, it makes for a sound that draws forth images of beach-based movies, European dramas, and the swinging sixties. It’s like the music your cool aunt used to listen to, but you know this would annoy her now as it’s too different, too individual. But it’s her interpretation of this era that sets her sound apart. The tempo of this falls someplace between Patsy Cline and Patti Smith, Please Be Mine, from Burchs first record, is a favourite of ours. It’s led by the drums and Burchs vocal, added entertainment is the fact that the lead guitarist appears to be playing and singing from the middle of a palm tree. It’s a beautiful thing, even if the tree is a little disconcerting. Her writing seems like therapy, though like all good therapy, real-world changes are promoted. The broken heart that seems to perpetuate her writing was healed somewhat by a rekindled relationship, one that as yet doesn’t seem to have taken the melancholy away from her vision. Downhearted is another slice of real life, charting difficulties and confusion, it’s all therapy. That she signed to the same label that brought us the Dum Dum Girls and the Oh Sees would suggest that they saw the same thing everyone else does. In a word, it’s sincerity. The remarkable turnaround of her demo and the hype that surrounds her now seem to have unfazed her. Her frequent moves made creating this record, finding a band, writing anew and making it all work seem like a torturous thing, though one she seems to have weathered pretty well, all things considered. What all this leaves is a sound that is clear, controlled, pure and in many ways simple in its execution. In a set that was all too short, there wasn’t a lot of banter, the room was perfectly quiet, a rarity in Leaf, let’s be honest. It’s fair to say the majority of punters there would happily have sat around a while longer. It’s back to the letter S for us. Sublime stuff.